We are a proud member of the nation’s largest chain of drop-off stores and the #1 seller on eBay. iSOLD It helps individuals, businesses, and fundraisers get top dollar by selling items online. Save time and rely on our expertise to make e-commerce work best for you. Please call us or stop by our store today. 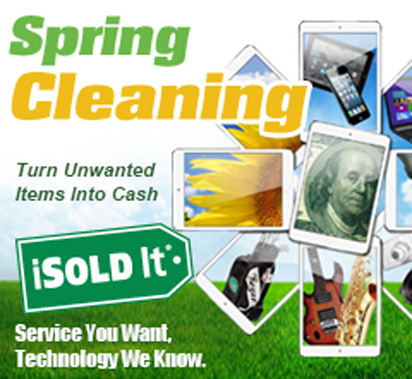 As a Registered eBay Drop-Off Location (REDOL) and Platinum level PowerSeller, iSOLD It Gaithersburg meets eBay’s most stringent Trading Assistant requirements. We also use Amazon, Craigslist, and other online sites when advantageous. iSOLD It Gaithersburg, Maryland, has developed a wide following over our 10-year history. Customers come from all over the Washington, DC, metropolitan area and beyond. We are a trusted selling service for those in Baltimore, Clarksburg, Columbia, Damascus, Darnestown, Frederick, Poolesville, Potomac, Gaithersburg, Germantown, Hagerstown, Kentlands, Lakelands, Montgomery County, Olney, Rockville, Shady Grove, and more cities through the state. We also serve customers in Alexandria, Arlington, Fairfax, McLean, and Tysons Corner. And we are more than an online selling business. Over the years, iSOLD It Gaithersburg has added a host of other services – be sure to check them out!